Masters of comedy David Wain (“Wet Hot American Summer”) and Ken Marino team up behind the scenes and in front of the camera to create THE TEN: a lively, smart, and irreverent film about breaking all the rules. 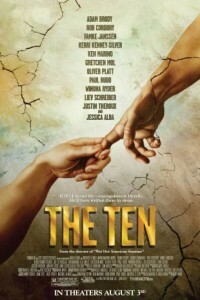 Directed by Wain and written by Wain and Marino, THE TEN presents a series of interconnected comic sketches designed to reinterpret – and reinvent – the Ten Commandments, making them “meaningful” (and funny) to a young, hip, audience of contemporary sinners. With each story told in a different style, but containing overlapping characters and themes, the film is a grand burlesque boasting an all-star cast that puts the sin back in cinema.